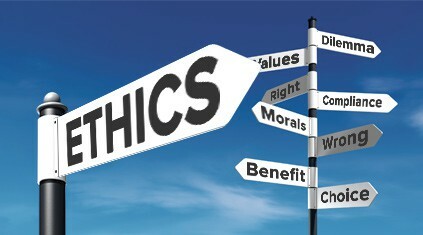 When it comes to ethics, everyone has their own definition of what is ethical and what is not. For many people, what it means to be ethical is very clearly defined in their mind. However, there are many people that have no clear definition of what it means to be an ethical leader. The characteristics of an ethical leader that seem completely clear to one person, can make no sense to others. What is completely ethical to one leader may be completely wrong to another leader. What is your ethical evaluation criteria? 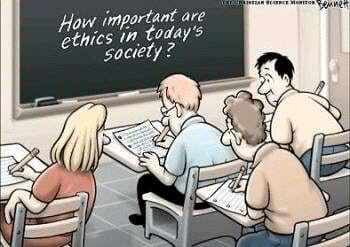 How do you determine if your behavior is ethical or not? In many professional fields there are codes of ethics. The codes of ethics creates a standard for everyone to follow. It sets expectations for people to follow. In addition, within some of those professional fields there are specific laid out consequences for those who do not follow the codes of ethics. Engineers shall hold paramount the safety, health, and welfare of the public in the performance of their professional duties. Engineers shall act in professional matters for each employer or client as faithful agents or trustees and shall avoid conflicts of interest. Engineers shall build their professional reputation on the merit of their service and shall not compete unfairly with others. Engineers shall act in such a manner as to uphold and enhance the honor, integrity, and dignity of the engineering profession. Engineers shall continue their profession development throughout their careers and shall provide opportunities for the professional development of those engineers under their supervision. The civil engineering code of ethics helps engineers to be ethical leaders. It guides them when making decisions on how they will act as they do their work. It helps them know how to respond to different ethical situations when they arise. At the same time, the code develops trust in engineering customers. If you are in an industry that has a code of ethics, do your very best to follow the code. Keep the code in a place where it is very visible so that you can see it all the time as a reminder of the ethical standards you are to follow. Additionally, this will help you to become an ethical leader for those that you lead. If you are in an industry that does not have a code of ethics, create your own code of ethics. Use the code of ethics to become an ethical leader and set the example for those you lead. It is very important to set your own ethical standard so you know how you will behave in a given situation. When the moment arises that you have to make an ethical decision, you will know how to respond because you will have already been living the ethical standards in your code of ethics. You will not have to think about how to respond. What to Include in Your Code of Ethics? As an ethical leader, create an ethical standard within your organization that clearly defines the principles you expect people to live by. As you notice from the American Society of Civil Engineers Code of Ethics, it does not clearly state what you should do in each situation, but it does give you a strong framework to guide your decision making when situations do arise. In addition to your code of ethics, you can create company policies and procedures to enforce the code of ethics. It can outline unacceptable behavior as well as potential consequences for disobedience. As an ethical leader, your goal is to train others to be ethical leaders as well. Once you have created your organizational code of ethics, train everyone on it and how to effectively follow it. Initially, you will want to read through the code of ethics with everyone and then you will want to follow up on it regularly. Talk about the code of ethics on a regular basis. Bring it up in regular meetings so that everyone is always thinking about it. As you bring it up, talk about different ethical situations that could arise. Brainstorm solutions for how to address them when they do arise. And, identify situations that have arisen and how they were handled. In addition to training everyone, place the code of ethics in an area that is clearly visible for everyone to see. Additionally, you can put it in an area where customers will see it so they will know the ethics that you and your organization live by. By creating, training, and following through on the code of ethics, you will help others to be ethical leaders. That will help your company to value ethics and ethical behavior. In the long run, that can potentially save you from legal or other problems. Do you have a code of ethics within your company? What impact does it have? Please share your thoughts and comments in the comments section below!